If Justin Upton and Chris Young were born in England or India or the Trobriand Islands rather than the exotic locales of Virginia and Texas, they might be swinging a different kind of bat. Back in February, Upton and Young tried the sport that has some similarities — and some vast differences — to the sport with which they make their livelihood. Aditya Thyagarajan and Abhimanyu Rajp, players on the U.S. national cricket team, came to Salt River Fields at Talking Stick to give the D-backs outfielders a lesson in the sport, and give them a chance to go deep. My favorite part of that video? At least one of their teammates thought it was as much fun as they did. Perhaps learning how to be a bowler, as they call it in cricket, D-backs pitcher Barry Enright shows up around the 2:30 mark shooting some video. 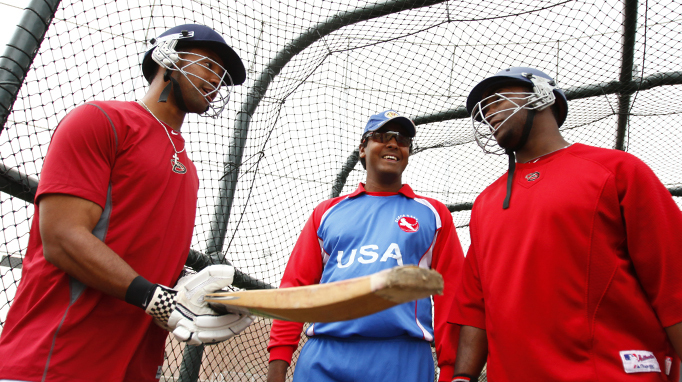 It was a fun afternoon, and Upton and Young developed a new respect for the hugely popular international sport. Photographer Jordan Megenhardt was on the scene to capture some images.